Update: uTorrent is now available for OS X without having to install Darwine (which is the method used in this tutorial). Another name for this tutorial could be “how to install Windows programs in OS X without buying Crossover“. Or “how to use Darwine to install Windows programs in OS X”. 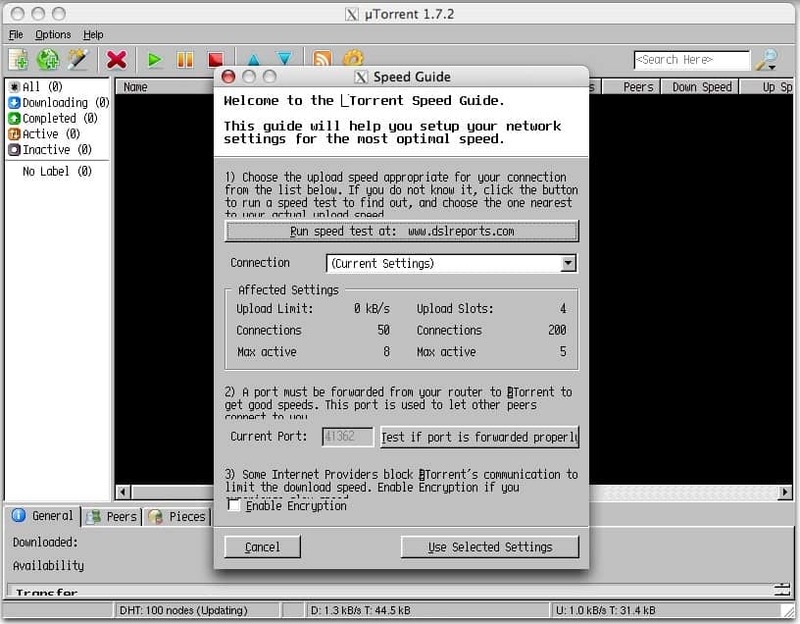 But this tutorial will take you step-by-step through installing uTorrent (which is currently Windows-only) via Darwine – an OS X port of Wine. Unpack Darwine and drag the entire Darwine folder to your Applications. Then locate and double-click the WineHelper.app file in the Darwine folder. A small Process Window will appear. You can minimize it to your Dock or just ignore it. Navigate to the utorrent.exe file, select it, and click Open. A bunch of text will fly by in the Wine Log window. Ignore it. And you’ll be prompted to install uTorrent. Leaving the shortcut boxes checked is fine, but you clearly won’t have a “start menu” shortcut when the installation is done (though you will have a desktop shortcut). That’s it. uTorrent will launch and ask if you’d like it to be the default application for opening .torrent files. Select your Connection speed etc, and click the Use Selected Settings button. You should also notice a shortcut to uTorrent on your desktop. Darwine is also able to run many other Windows programs. Probably not as many as Crossover, but the price is right. Hey – Saw you linked to Darwine from me.. Just a tip to make it work better from your Darwine Output – Install/Create the Symlink for Freetype2(“ln -s /Developer/SDKsMacOSX10.4u.sdk/usr/X11R6/lib/libfreetype. * /usr/lib/*” to create a Symlink if you have XCode installed. If not, you can install it via Fink/MacPorts and create a symlink with those install locations ). Also, having Fontforge is useful and should prevent some errors. Hi, I’m using macbook…and when i try to install X11 it says that i have a newer version already? is there a way for me to install it anyway? or…is there anything i can do so i can use Utorrent? thanks! If you go to Applications -> Utilities is X11 already there? If so, you can just skip that step as you already have it installed.. I have installed Utorrent on my mac….but I m not able to see the files on my browser…Do you know if it will use Safari or I have to install some program winehelper??? FANTASTIC!!! I was struggling with Darwine for some unfathomable reason until I came across this page. Just wanted to express my gratitude for a job well done. I tried to email you but it bounced – what’s the exact error you’re getting? Can you copy/paste it here? Thanks! how do you scan for the virus when puting it on macs? because i know you have to for windows. he estado tratando, seguí todos los pasos pero al final no me abre el utorrent para instalarlo. si alguno me puede ayudar se lo agradecería mucho. I have the exact same problem, I’ve been looking through the coding and it supports some error saying it couldn’t load main module. The error information shows up after the http://www.freetype.org in the information log box for wine. I noticed in the guided pictures it was using xterm to support and install utorrent, I wasn’t sure if it was a problem with my xterm, if it was an error installing it or if i should try to install it again (because it had seemed to instal smoothly and without error when I did it),or what the problem could possibly be. If someone could please help, I could send you more information or copy and paste the log info. also; the utorrent keeps on getting stuck, it justs stops everything, u cqnt click on anything for a while then it fixes itself all of sudden?! plse help!! After it mentions freetype.org in the log it gives me error saying it couldn’t load main module. I tried installing freetype2 but however its done I can’t figure it out. What am I missing here? I downloaded darwine successfully, but when i go to open and install utorrent it says it is unable to locate X11.app. Can anyone help me on installing that, same problem as andy, can anyone help? If you cant find X11.app, make sure you have X11 installed. These builds of Darwine are for _Intel_ Mac’s. G4’s wont run it. And buy a mouse with two buttons for right click. Wine doesn’t support right click emulation. How do I make mu torrent compatible with itunes? I am using Power PC G4 for my mac . Whilst trying to get utorrent and wine , I realise it is only good for CPU intel, Please advise how I can open use utorrent for the above mac..
X connection to :0.0 broken (explicit kill or server shutdown). get this error everytime i try to install cananyone help? it doesn’t ask me to instale utorrent what should i do? it after i open the wineHelper and go to applications, open utorrent, the wine log runs by and then it says utorrent-1.8-beta-9704.upx.exe has exited with an error, have a look at the Log window… what should i do? Download uTorrent version 1.7.2 (the version I used in the tutorial) from http://www.oldversion.com/program.php?n=utorrent and give it a try. Darwine probably can’t run the latest version (1.8 beta 9704). I got this working to test drive Darwine.. I then tried the ever elusive Voipcheap [Betamax – http://www.voipcheap.com] client. I thought it was a relatively simple windows client but nothing seems to work. Installs fine – but crashes on launch. There are a heap of the same app – named differently [voipbuster etc] so one fix will fix them all. I have the same problem as Mike and Mal. If you fixed it, don’t keep it to yourself, SHARE IT! Please let me know if you learn a way to get uTorrent installed. I’m running OS 10.4.11 Tiger and uTorrent’s prompt window never appears. Hi! Need help, was fine installing utorrent till stage 3 however post that wasn’t able to get utorrent.exe file to appear on my desktop. Will someone be kind enough to advice as to where in going wrong. ive got a problem using Darwine over here, when i tried to install cs 1.6 using darwine in my iMac intel, it asked me for the destination folder and when i clicked browse it suddenly just quit and an error message came out. so anyone please help me, what do i do!? how can i install cs 1.6!? I downloaded Wine and installed it per your instructions and it worked great! 2008-07-24 04:32:49.096 WineHelper *** NSTask: Task create for path /Users/thomasbritten/Desktop/WineHelper.app failed: 13, “Permission denied”. For the life of me I cannot get this to work. I keep getting the error 2008-07-24 04:32:49.096 WineHelper *** NSTask: Task create for path /Users/thomasbritten/Desktop/WineHelper.app failed: 13, “Permission denied”. It used to work fine so I am assuming I did something wrong but don’t know what? My permissions have not changed and I an administrator on this MAC so if you have any ideas it would be very helpful! i got all the way through the how to and now i get this in the wine log . and yes im new to mac . can any body offer any help thanks …. Application tried to create a window, but no driver could be loaded. Thanks to whoever wrote this! It was really helpful. Keep up the good work for the rest of us lesser tech literate people. when I choose utorrent from the winehelper a bunch of text appears but then it says: error!!! plz guys answer me back!! I really need your help. Hi , When I double click on the WineHelper as the tutorial says, the process window does not show up, thus I am unable to perform step 3 of this tutorial ie go to Applications- Open- etc ….. Can someone help? Thank you. Hi I am trying set up Darwin and utorrent so that I can use internet explorer on on my mac. I have successfully gone through step five above, but after I try to open utorrent in Wine helper, a dialog box opens up and says ” utorrent.exe has exited with an error, have a look at the Log window…” any suggestions on what to do to get utorrent working? Or, you know, use the mac version. I have tried it with the new version…. 1.7.5 and… 1.7.2 which was a recommendation by you. The same thing comes up. which preliminary file of darwine do i download for my macbook?